Maybe you already doing it, but haven’t quite figured out how it can be turned into a business? 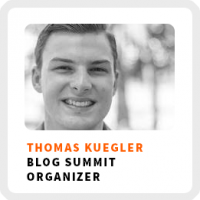 Thomas Kuegler is going to share how to build a blogging business. His blog helped him gain his freedom and now wants to teach you how you can do it too! He’s a blogger, digital nomad, and content marketer serving as the editor-in-chief of the Post-Grad Survival Guide he has over 18,000 followers on Medium, so check out his musing there too! Thomas has also created an amazing online conference called the Grow Your Blog Summit. He interviews an amazing line up of 30+ speakers including Chris Brogan, Dorie Clark and yours truly! How to explain what you do to family and friends when your work is unconventional. Finding your voice, building a platform, and making money through blogging. How Thomas gets into the details about how he pulled together his online summit. How to build a following on Medium by writing five days a week. How to use social proof to support new risks. Wake up time: 7:00am, every day of the week. Ideal work environment: In his home office, in front of a window, between 8:00-10:00am. Definition of success: Making the money he needs to make and being able to help people. Regains focus by: Watching a movie and getting inspired, particularly Skyfall. 90-day goal: Make enough money so he can take a 3-6 month trip to southeast Asia. 1) Make a Medium profile and start posting 5 times per week. 2) Practice both your writing and being consistent. 3) Take notes on your thoughts throughout the day to use as writing material.